March 10, 1897 dawned mild and sunny. The spring rains had turned the dusty roads into sticky black mud. The two black ponies didn't seem to mind as they pulled the buggy along the road to Cambria. Gertie's new pink woolen dress with the leg o'mutton sleeves and high neck, was tucked out of the way of any stray spatters. Her pretty black hair was pulled smoothly to the back of her head and into a bun, but a fringe of tightly curled bangs softened the outline of her face. She was 18 1/2, and she felt the weight of her years. This was such a final and big step. She looked shyly at the serious young face of Newt as he sat beside her, and smiled dreamily to herself. It was a big step, but she was very sure it was the right one. Newt sat rather stiffly beside her. The hard white celluloid collar of his shirt and the unfamiliar made new suit made him uncomfortable, but very conscious of this new responsibility he was taking on. 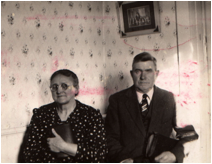 In the dim cool parlor of the Cambria Methodist parsonage the kindly minister and his wife welcomed them, and they solemnly repeated the vows that made them man and wife, "until death do us part." The trip home was longer, for the ponies managed to get the buggy stuck. Newt, very much aware of his new status and responsibility, gave one of them a smart "pat on the back", and he promptly broke the single tree! Mr. Moser, a neighbor, came to the rescue with another. The traditional charivari was staged that night at the Robinson home. The cousins and friends in whose homes they had gathered for socials and parties; who had vied with each other at the box suppers, literary programs and spelling bees, and had joined them in hilarious games of Spin the Platter, Pass the Button and Post Office; now came to give them a rousing send off for their journey together. Their first year was spent with mother Coffey, and Newt helped with the farm and worked rented land for himself. After a while they moved to the Glasgough Holder house east of the Willow Grove school house, and then to the Slocum place. Newt hauled milk for the Humeston Creamery. He first started farming on the Becker place 3 miles south and 2 west of Humeston. By that time Carl and Bill had joined the family and Newt decided it was time to start farming now that he had a couple of boys to help him. Of course it would be a year or two, another boy, Leo, and a few girls later, before they would be much help. However, they added plenty of interest to life on the farm as Mother or Dad had to rescue them from one scrape after another. Carl, with his insatiable bump of curiosity and seemingly charmed life, was the leader, coming out of most of their escapades without a scratch while Bill had to constantly be rescued and be patched up. Life wasn't all play, and there was much that small hands and feet could do to lighten the load, so their extra energy was soon channeled into chores such as carrying wood and water, getting the cows, milking, and other tasks to leave Mom and Dad free for the harder work. As the girls Opal, Mildred, Carol and Velma came along, there was more work but many hands and shared tasks made the long hours seem less burdensome. Girls and boys alike milked cows, plowed fields, slopped hogs, carried water, washed and ironed clothes, prepared meals, hoed the garden, canned the fruits and vegetables, and many other tasks. The walls of the old four room house, where they lived eight or ten years, bulged at the seams with seven children and their many friends. The week was not complete without Sunday School and Church at the Unity Baptist Church. Newt in later years became a deacon along with several of his brothers. In 1911 they bought the Moody Robinson place south and west of Humeston. 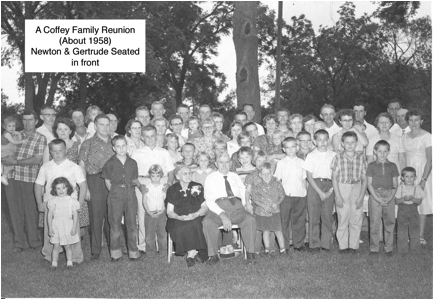 It was there that the rest of the family was born, Erma, Raymond and Dorothy, rounding it out to ten children. Newt's orchard of peaches and watermelon patch became well known landmarks. The door was always open to friends and neighbors, and all were made to feel like members of the family. Watermelon feeds in the fall were standard procedure in a good year. Hundreds of bushels of peaches were canned and eaten. Great piles of apples were buried in straw in the yard, and the cold crisp apples were eaten along with dishpans of popcorn and enjoyed on the long winter evenings. The boys and girls loved to get Newt talking about his boyhood in Indiana. About working in the coal mines as a 'pusher', that they lived on wild persimmons, blackberries, sassafras tea and maple sugar. There were stories of living in Terra Haute, Indiana. They moved there from High Mary (later known as Pittsburgh) because the first three buildings that went up there when the big coal company came in were two saloons and a gambling hall. Their Dad decided it was time to get his boys out of there. Then started the long trip in the covered wagon to Wayne County, Iowa. Then gradually the children left to begin their own lives and homes. 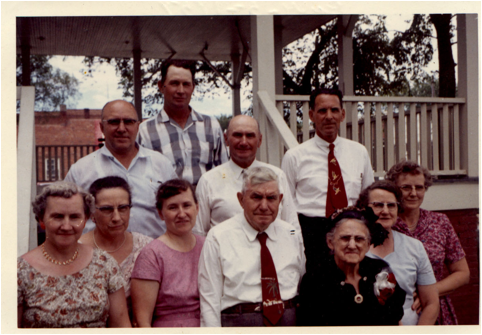 Grand children made their appearances and as the years lengthened, so did the miles traveled; for Bill went to Wyoming to begin his family, Opal in the nursing profession also traveled to different parts of the world. Velma became a missionary in Colombia, South America. Four of the girls became registered nurses -- Opal, Mildred, Erma and Carol. Mildred and Erma served in the Army Nurse Corp during World War II. Dad Coffey retired from the farm and they settled in Garden Grove. Their 50th wedding anniversary came and went, as did the 60th. Children and grandchildren, and great grandchildren, came to visit and left with lighter hearts -- and with gifts of Dad's honey, or berries, or eggs. Seldom did they miss Sunday School and Church, and seldom did Dad miss his daily trip after the mail and groceries. The first break in the family circle came when Opal died in 1964, and then Bill, too, left the circle. The year 1967 came, along with the realization that 70 years had come and gone. Still sprightly of step and bright of eye Newt had lived up to his responsibility. Mother's hair was no longer black but her eyes still sparkled, and with only the aid of a cane she still managed her home -- and Dad. March 10, 1967 also dawned mild and sunny, and the milestone of 70 years came and went. On March 12th open house was held in the Garden Grove school lunch room. 203 friends and relatives joined to wish them many more. 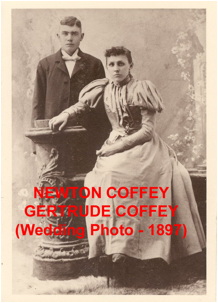 Newton is age 4, in the household of William and Malcena Coffey. At home are Cresse, Newton, Effa and Driden. They live next door to William’s brother Benjamin. Newton and Adelia G “Coffee” are farming a rented farm. They have two children living at home, Carl and William. Newton is 34, Adelia G. is 31. They have been married 12 years, and she has had 8 children all of whom are living. At home are Carl, William, Leo, Opal, Mildred, Carol and Velma. They own their farm, and have a mortgage on it. And they appear to live on the farm adjacent to Newton’s mother, Malcena Coffey (see notes). Newton reports he earned $500 in 1914. His farm is worth $11,800, and it has a mortgage of $5500. 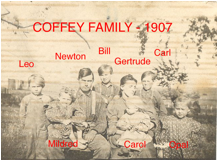 Census taker came by on January 13 and found “Nute” Coffey (age 45) and Gertrude (42) with all 10 children living at home. They own their home, but have a mortgage on it. Carl (22), William (20) and Leo (19) are all working at farming. At least Carl is working for wages (presumably outside the home farm) but not clear about Bill and Leo. Opal (17), Mildred (16), Carol (14), Velma (12), Erma (9) and Ramon (7) are attending school. Dorothy (2) is just loafing about. 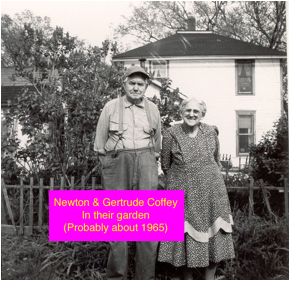 Newton reports he attended school through grade 7, and Gertrude through grade 10. At home are Opal, Mildred, Carroll, Velma, Erma, Raymond, and Dorothy. They rent their home (I understand they lost their farm when the depression began), live on a farm, and own a radio. Erma, Raymond, Dorothy and Velma are living at home at the time of census -- and all have attended school within the past year. Interestingly, Erma is shown as having been born in Illinois? Newton and Gertrude are now alone, all the kids have left. He is a farmer, they are renting, and they lived in the same house in 1935. 1880 CENSUS: She is age 1. See notes with her father, Moody Robinson for details.